Dust devils seen by the Spirit rover. Dust devils are spinning columns of wind that move across the landscape, pick up dust, and look somewhat like miniature tornadoes. Dust devils occur commonly in dry and desert landscapes on Earth, as well as Mars. They form when the ground heats up during the day, warming the air immediately above the surface. As the warmed air nearest the surface begins to rise, it spins. The spinning column begins to move across the surface and picks up loose dust. The dust makes the vortex visible. On Earth, dust devils typically last for only a few minutes. 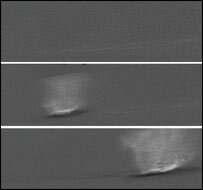 When dust devils pass over the surface of Mars, they leave dark, crisscrossing streaks on the land. They can cross over hills, run straight across dunes and ripples, and go through fields of house-sized boulders. The dust devils remove bright dust from the terrain, revealing a darker surface underneath. The dust devils in the photos shown here were recorded by the Mars Exploration Rover Spirit in Gusev Crater on April 15 and 18, 2005.